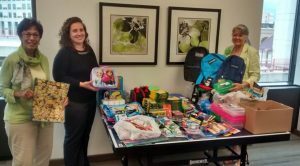 The staff at Legacy Trust once again partnered with Family Promise of Grand Rapids to collect backpacks and school supplies to help local families. The supplies were gathered throughout the month of August and delivered to Family Promise of Grand Rapids who distributed the items before the start of the school year. Family Promise of Grand Rapids is a local organization who is dedicated to helping homeless families by providing parents the hope and encouragement they need to help their kids and end the cycle of homelessness. The staff at Legacy Trust is committed to giving back to our community and we are proud to partner with such a wonderful organization!